So I’ve finally made my first painting. And I’m going to keep doing it. I had a vision of this and I got together with some friends to have a painting night. We were productive and we had a great time. 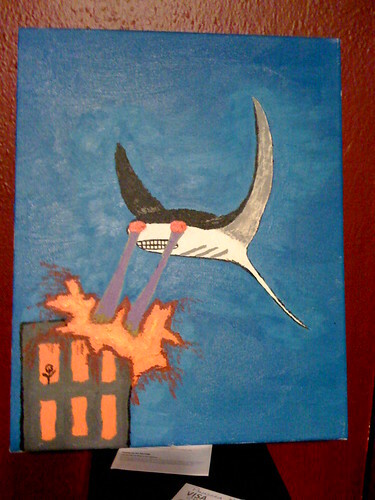 My first painting is called “manta ray, laser eyes : killing a building”. I didn’t come up with the “killing a building” part but Dave did and it fits well. Thanks Dave. I don’t think it really needs any explanation. The manta ray has his motives. If you want to ask him, go ahead. But be warned. "manta ray, laser eyes : killing a building"
Oh my God! That one stick figured man is all alone during such mayhem. Sad. Strong work Kelly. Truly awe inspiring. Kelly, I just built several canvases. No idea where to go from there. Love your site btw! I found your site while researching manta rays. Your painting is awesome and inspired me to take a different angle for my own project. Thanks for the lightbulb! I know no one has commented on your painting in a few yrs but, like someone else said, I found it while searcing for Manta Ray monsters. I love it!!!! I only wish I had a better pic of it straight on, since the pic here is a little askew. BUT! It’s great! Finished my first quarter of grad school! Painting #3 – ZEBRA BITE!!! REVIEW — Nick… on SHARK DIVE!!! Friday night Chow Tr… on SHARK DIVE!! !